Tax avoidance and illicit financial flows deprive African countries of crucial resources needed for development — for health, education and other basic requirements. This was the central message of Fr Charles Chilufya SJ, Director of the Justice and Ecology Network for the Jesuit Conference of Africa and Madagascar, on his visit to Canada as the guest of Canadian Jesuits International (CJI). While in Canada, Fr Chilufya also met with networks and organizations in Canada that work on corporate social responsibility, including the Canadian Network on Corporate Accountability (CNCA), and he was interviewed by The Catholic Register and by Salt and Light TV. 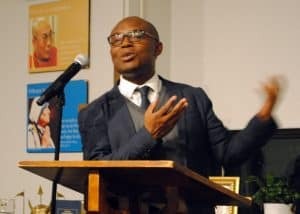 In his public address in Toronto, Fr Chilufya presented a number of facts illustrating the scale of global inequality, which has important ethical implications for a shared “duty of care,” meaning the implicit responsibilities individuals bear toward others in our global context. For example, while the richest 1% in the world owns 47% of global wealth, the bottom 50% owns less than 1%. And while sub-Saharan Africa receives $134 billion in foreign investment, loans and development aid, $192 billion is taken out of the region, leaving a $58 billion shortfall. With justice and transparency, a much fairer share of the billions currently being taken out of Africa and put into tax havens could be recouped and harnessed for the good of all Africans through investments in education, healthcare, clean water, agricultural development, and more. The duty of care for Canadians was made clear by Fr Chilufya, beginning with the simple fact that between 50% and 60% of the world’s resource extraction companies are listed on the Toronto Stock Exchange. How these transnational companies do business around the world should be of concern to Canadians. Overall, the companies’ record is not good. Last year, for example, three subsidiaries of Acacia Mining in Tanzania were charged with money laundering and tax evasion amounting to hundreds of millions of dollars. And in neighbouring Zambia, First Quantum Minerals allegedly owed the Zambian government US$8 billion in back taxes related to unpaid custom duties. Clearly, such sums of money could do enormous good for the people in these developing countries. Support CJI’s advocacy efforts in conjunction with the CNCA (of which it is a member) to ensure that the Canadian Ombudsperson for Responsible Enterprise (CORE), recently appointed by the government, is not a “powerless advisory post” but one with real power and independent authority as originally promised. Donate to the new Leadership Development and Mentorship program established by the Jesuits in Africa. This program promotes transparency and ethical leadership formation among young people who will be the business and political leaders of tomorrow. The goods of the earth are meant for everyone, and however much someone may parade his property, which is legitimate, it has a social mortgage—always. In this way we move beyond purely economic justice, based on commerce, towards social justice, which upholds the fundamental human right to a dignified life.